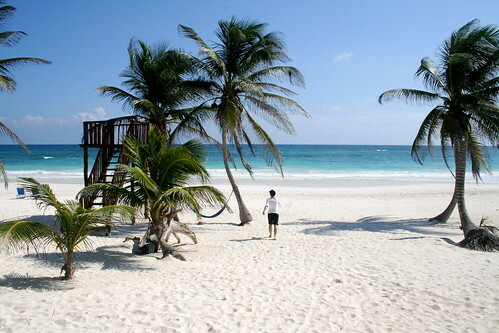 My friend R just got back from Tulum, Mexico. My husband and I went in December 2007 with a couple of our friends. Oh man. I miss it. I was one happy person. The thing is, it wasn’t just the wonderful weather and water and food. It was the sense of leaving everything behind, just living out of our small bags, eating real food, spending time outside everyday, with someone you love, with easy company, and seeing how people live in another part of the world, feeling connected. It really gave me a new perspective on life. I’d love to see more of the world. I’d also love to go back to a paradise like this again. My memories of those balmy, breezy days are made of happy. Where is your earthly paradise? This entry was posted on Tuesday, January 13th, 2009 at 10:30 am	and is filed under Uncategorized. You can follow any responses to this entry through the RSS 2.0 feed. You can leave a response, or trackback from your own site. I definitely think we’d be down for a trip like this at some point in the not too distant future. It was amazing! And, my wonderful girlfriend “R” was an awesome traveling partner.